Main application of our bevel gears is for 90 degree gear drive for our agricultural gearboxes, T gearboxes and so on, also we sell all gears components as well. Bevel gears are concurrent gears, that is to say the axes of the two shafts cross at a point. The gears themselves are conically shaped. As for all gears, the two conical wheels will only mesh if the modules are equal. As well as that, the conical pitch angles must have a common generator and their projected apexes must meet at a point. These types of gears operate as inseperable pairs. One bevel wheel is designed to work with it's complementary wheel and no other. A bevel gear is not compatible with just any old bevel gear ! 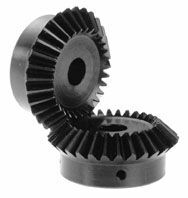 Bevel gears are manufactured in pairs, to work together. These gears have the double peculiarity of being beveled and helical at the same time. Thus they acculmulate the advantages and disadvantages of the two families. They are designed for an angle change of 90?where the two axes are concurrent (intersect at a point) and are in the same plane. The assembly must, consequentially, be very precisely done. As for helical gears, the teeth have a helical angle, which must be complementary to that of the other gear of the pair. This helical angle produces a meshing which is silent and very smooth. This method of change in direction allows fast rotational speeds with neither vibration nor noise. These componants must be changed as a pair. It is never possible to change one single wheel.